It’s Super Bowl Sunday again! Who is rooting for the Patriots? How about the Rams? I especially enjoy those $5.5 million ads. Today’s word of God takes us back in our imaginations over six centuries before Jesus, traumatic times for ancient Israel. In this passage, God called Jeremiah to be a prophet, to speak on God’s behalf. Jeremiah describes how the Hebrews were unfaithful to their promises in the covenant; and then he proclaims a new covenant and urges the Hebrews not to fight against the ancient Babylonians. How unpatriotic and outrageous of Jeremiah to say this, many Hebrews said. Yet, because Jeremiah believed God was with him, he continued to speak God’s message courageously. The author may asking whether we stand up for what’s right, or do we simply go along to get along. Paul, in his letter to the Christian community in Corinth, poetically describes the many facets of love. Love, Paul wrote, is not showy. It is not envious or rude or irritable. Nor does love insist on its own way. No, love is like a prism that reflects the myriad characteristics of love: patience, kindness, generosity, faithfulness, forgiveness, compassion, self-discipline, peace, joy. Above all, love never ceases because God is love. Paul may be asking whether we reflect these characteristics of love in our everyday attitudes and behaviors. In the Gospel according to Luke, Jesus pursued his mission uncompromisingly. He proclaimed that the kingdom of God was breaking into our midst, and that all people can share in this kingdom by living a life of discipleship, of virtue. That God would include all people – even non-Jews -- shocked and outraged many in the synagogue. 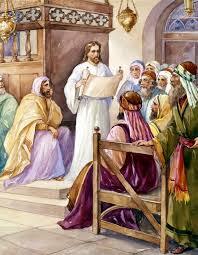 Jesus encountered opposition even from his own townspeople. And yet, because God was with him, Jesus continued his mission in life. Jeremiah, Paul, and Jesus had one passion in life: to speak God's message. That message fired them up. The question for us is, what energizes us? Where do we find purpose in our lives? Some argue convincingly that we find meaning in a mix of what we do, what we experience, and our attitude toward our own inescapable suffering and dying. Life indeed is worth living to the end. This raises the question, what are human beings meant for? What is our life all about? Most of our finest thinkers hold that we are meant for something greater than merely existing. Something far beyond mere animal instincts, beyond acquiring and spending, beyond the economic feats and engineering marvels of this world. What is that “something?” The answer points to something transcendent, beyond ourselves: the human spirit. Always open to a relationship with an awesome God and to one another. Yes, our purpose in life, no matter what our profession or how old we are, is to be in relationship with God and one another forever. Something to think about and do in light of the word of God.